Summer is amongst us (also known as melted coconut oil season) and it is time to throw on a pair of jean shorts or a sleeveless floral print dress, and let your skin shine! We thrive from having contact with the sun, as it is our energizing daily source of vitamin D. Although the sun can physically and emotionally benefit us in many ways, we know that it is important to take proper care of our largest organ – our skin! As dead skin cells increase in melanin from the sun, it is a good idea (unless the skin is burned!) to exfoliate and support the process of regenerating new skin cell growth. Using coconut oil and epsom salts as a general body scrub will help the skin stay soft and clean from bacteria. We love adding soothing essential oils to our body scrub recipe, as they can add fragrant, invigorating and relaxing responses in the body, depending on the essential oils used. 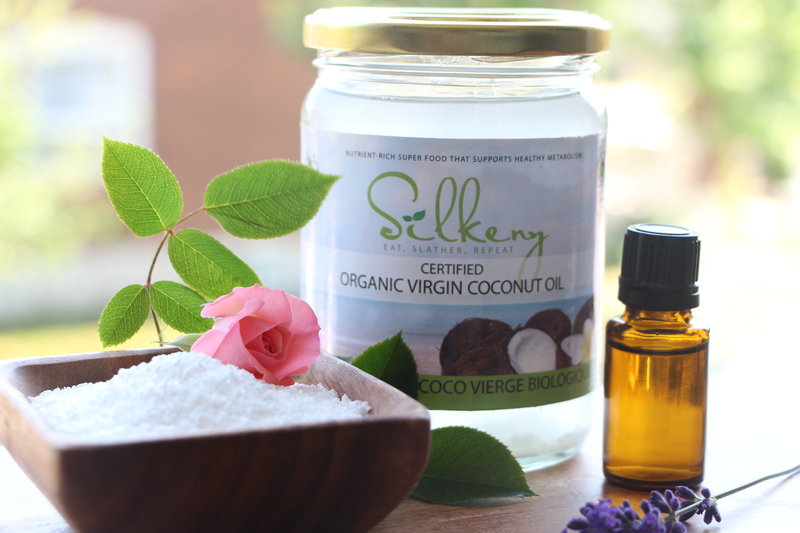 We recommend using Silkeny Coconut Oil for this body scrub recipe, as well as Living Libations essential oils, as we can affirm the integrity and quality behind these products. We chose to use lavender and peppermint oil to create an invigorating, yet calming and cooling effect for the summer. Here is our recipe for Silkeny soft, supple skin! Mix the essential oils and coconut oil in a small jar or cup and stir for up to a minute. Add the epsom salt to the coconut oil and mix. Stand in the shower and use the scrub on your dry body until you have used it all. Note: avoid touching your eyes or using the body scrub on the face as it can be too abrasive for such a sensitive area. Turn on your shower and wash everything off with water. Enjoy your new supple skin! Repeat this process every week or two. If you enjoyed this recipe please share it with your friends and family. We are so happy to provide information and recipes on the many uses of our coconut oil. We appreciate your feedback as always and look forward to connecting with you on our various social media platforms. Also, be sure to subscribe to our newsletter as we will be sharing more recipes and information like this. Don’t forget to visit www.silkeny.com/win and enter for a chance to win an all inclusive trip to Sri Lanka!